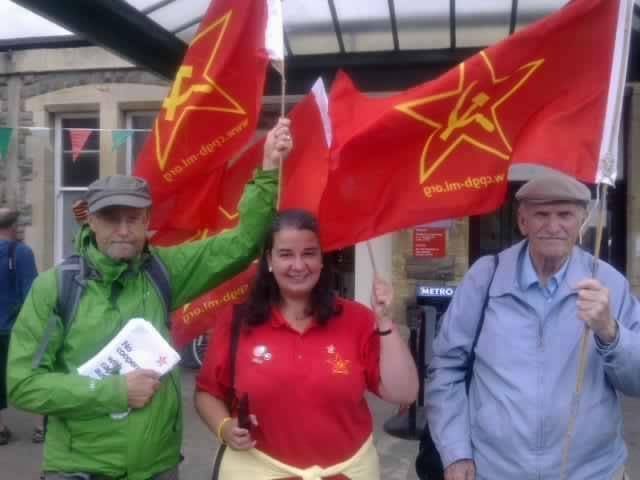 Party members from Merthyr, Swansea, Runcorn and Bristol brought our flags to Llanelli on 16 August to join the annual commemoration of the Llanelli 1911 rail strike, honouring the memories of the two workers slain by the British army. The murder was in brutal retaliation for the occupation of Llanelli rail station – an occupation which had succeeded in blocking the passage of a strike-breaking train, bringing all rail traffic to a halt. The two murdered comrades, Leonard Worsell and John John, were simple bystanders, viciously struck down by a military in complete panic at the sight of a risen working class. About a hundred people marched behind the band from the rail station to the town hall, pausing outside the house into which the two dying men were taken. In the town hall square, the organisers invited all who wished to speak to step forward. 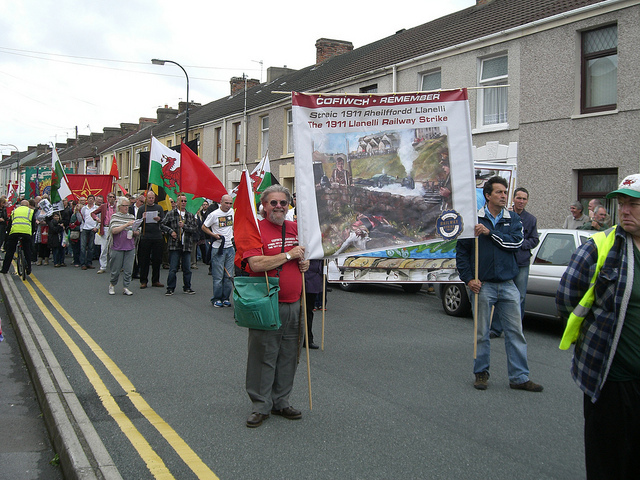 Whilst there was the expected point-scoring between Labour and Plaid reformists, most speeches celebrated the courage and solidarity of the working class in the face of state oppression. Our comrade pointed out that the violence inflicted on workers during the major industrial conflicts between 1908 and 1914 was soon to be dwarfed by the mass murder of workers in the imperialist war. He noted that both the ‘Great Unrest’ and the war itself had been the inevitable consequence of imperialist crisis, as was the current drive to austerity and war. We had to understand that austerity and war were not simply the ‘policy’ of this or that government, but the inevitable road taken by imperialism in time of global overproduction crisis. Our choice was between poverty and war under capitalism, or peace and prosperity under socialism. We then marched up the hill to Box Cemetery to honour the graves of the two fallen comrades.